Mobile phone model provided courtesy of Motorola Mobility, LLC/Lenovo. XF improves chip component and matching network analysis using a combined time-domain circuit solver and full wave electromagnetic solver. Import the schematic for a desired component via a netlist file, including SPICE elements such as resistors, capacitors, inductors, coupled inductors, and subcircuits. 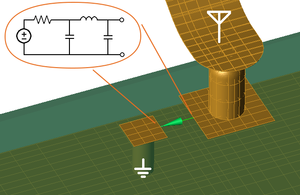 Complying with measurement standards and meeting performance expectations requires versatile antenna design software. 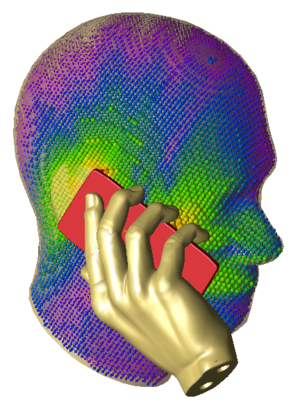 By supporting both CTIA and Poseable Hand models, XF simulates cell phone use scenarios for successful device design. CTIA models easily grip the phone for handheld and next-to-head operation, and Poseable Hand models offer numerous other orientations to mimic real-world positioning. Many configurations need to be tested during the design iteration phase - this is necessary for a thorough antenna analysis - but setting up each configuration manually can be a repetitive and time consuming process. A successful production environment requires automation and a customized workflow to maintain efficiency. Automation also applies to data export. 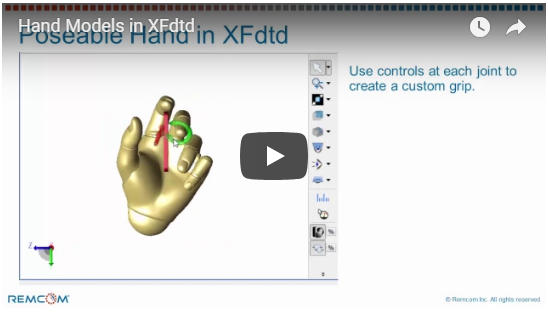 XF can consolidate data - S-Parameters, impedance, radiation, and system efficiency - from multiple simulations and export it to a spreadsheet. 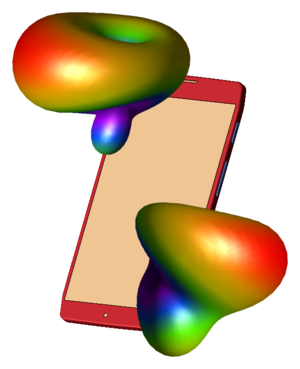 A mobile device is only as good as its wireless connection, so it is necessary to quantify antenna diversity within the EM simulation. XF considers field polarization and direction when computing complex correlation and mean effective gain outputs. This allows XF users to evaluate the quality and reliability of a device’s antenna system and then improve the design’s performance to capture the strongest wireless link in multipath situations. 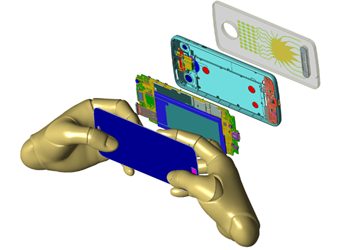 Complying with FCC standards is a requisite part of mobile device design that demands reliable EM simulation software. In addition to single antenna operation, XF has the ability to combine SAR results when there are multiple antennas operating in the same frequency band to get the total 1g and 10g SAR values. This allows engineering to keep power levels below the specified threshold and ensure a device performs within regulations. 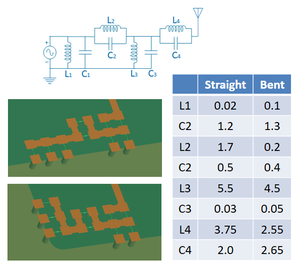 Determining the layout is only part of the matching circuit design process. Component values must then be selected with consideration to the actual antenna’s properties to ensure the design accepts a signal. Modern matching circuits include traditional RLC and tunable components, which presents a unique challenge when choosing a specific component to place in a matching network. user’s defined goals and thresholds, generating an efficient matching network. FW-MCO utilizes XF’s Circuit Element Optimizer feature. 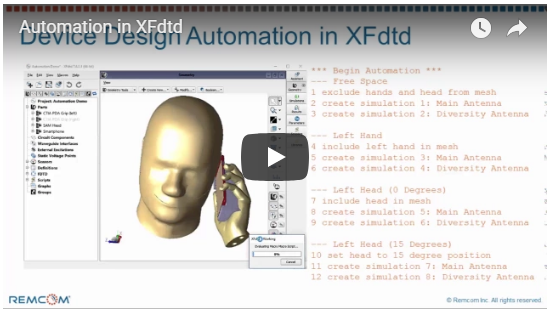 XF’s capabilities are the keystone of a comprehensive antenna design process that continues with indoor modeling. Wireless InSite supports XF’s radiation patterns as input and offers full control of defining a wireless environment. The ability to import files, create objects, and edit a floor plan ensures a realistic simulation, and site-specific placement of the transmitter helps to assess the device’s received power.